If there's anyone out there who's never felt like an imposter, or suffered from FOMO (fear of missing out), or struggled with self doubt, I sure would like to meet them. 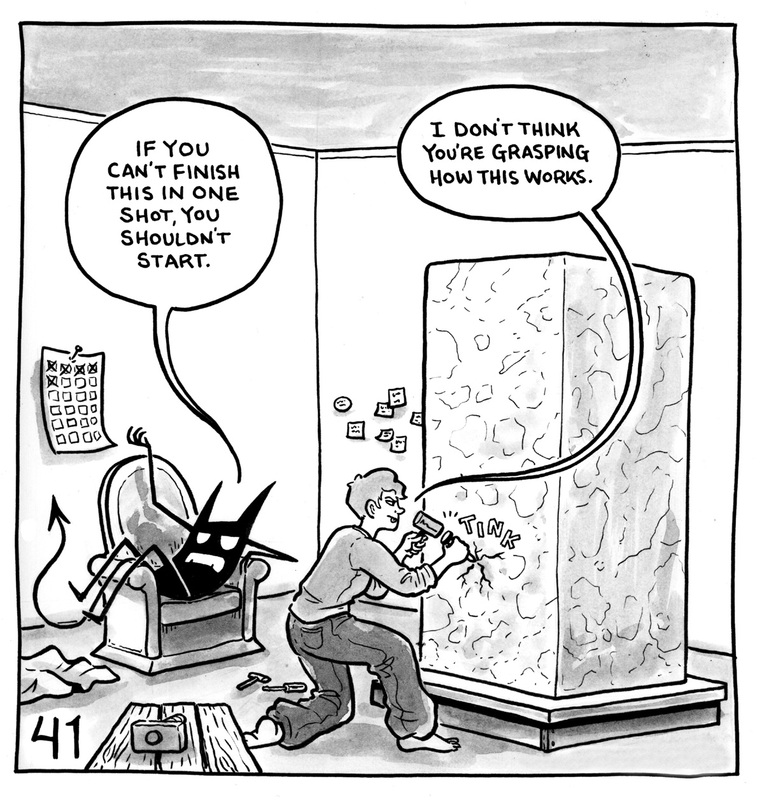 In 2017, for the 100 Day Project, Portland-based cartoonist Lucy Bellwood penned her own demon in a series of 100 comics. Those illustrations have now become a book titled 100 Demon Dialogues. In the forward she writes, "Back in 2012, entering my first year as a full-time freelance cartoonist, I hit an art rut. Trying to shake things up, I doodled a picture of a tiny, taunting inner imp who apparently believed I’d never make anything of myself." "He cropped up time and time again over the next five years — when things were going well and I was worried I’d lose everything, or when things were going poorly and I thought it’d never get any better. Each comic I drew about him brought a little more humor or clarity to our relationship, but I still felt like I was at his mercy," she continues. on how to banish him for good." 100 Demon Dialogues goes on sale June 19 but is available to pre-order now for $14.99 (paperback) or $7.99 (Kindle). Portlanders can meet Bellwood at the book's release party on June 4 at Ford Food & Drink. In addition to the book, she's got some cool demon-themed schwag and prints including this plushie for $25. I suggest making poking it with pins like a voodoo doll when self doubt starts creeping in. I used to see/hear Porky say this 20x a day. I want this on my tombstone, but maybe higher res.